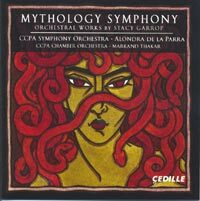 STACY GARROP (b.1969): Mythology Symphony (CCPA Symphony Orchestra; Alondra de la Parra), Thunderwalker, Shadow (CCPA Chamber Orchestra; Markand Thakar). Description: Bold, muscular neo-romantic works in a very tonal vocabulary, of which the large five-movement symphony, composed as a series of separate tone poems between 2007 and 2013, is especially impressive. The composer enjoys storytelling in music - in other words, she revels unashamedly in writing programme music, rich in detailed imagery but distinguished from film music (a medium in which she has not so far worked) by the structured narrative worked out in advance, to which the work's musical form and architecture adheres, forming a cogent dramatic arc rather than a series of picturesque scenes. Images and events are clearly illustrated by the distinctive character of themes and musical argument. The symphony's first and longest movement depicts Medusa's origin story, her transformation from beautiful woman (a beguiling violin solo developed in an extended lyrical episode) to hideous creature - the goddess Athena's vengeful rage, the writhing snakes and deadly eyes of the gorgon all graphically depicted. A lyrical slow intermezzo for chamber forces is Penelope awaiting Odysseus' return. The Sirens are next, in a kind of dramatic scherzo, luring sailors to their doom. The Morse SOS anachronistically but vividly depicts the impending catastrophe to befall the ship, culminating in a climax very reminiscent of Holst's Mars (which doesn't work mythologically, but is thunderously effective musically). The Fates spin, measure and cut the thread of a man's life; we hear the thread, a sinuous melodic line apparently of indeterminate length, the drama of the man's passing years, his impassioned entreaties to be allowed control of his destiny, and when denied, his fading heartbeat and the thread abruptly cut short. This dark movement, with its implacable steady tread, is the symphony's true slow movement. The finale introduces a naïve young Pandora innocently dancing to a folklike tune. Increasingly menacing music intrudes, and we are left in no doubt as to when the evils of the world escape from the opened box. A sad version of Pandora's theme ensues, then a major key coda as hope is also released. Thunderwalker describes a mythological construct of the composer's own making; a pagan god or nature-spirit of thunder. The three movements, as descriptive as the music is, are organized according to formal principles; a ritual fugue, an invocation in passacaglia form, a powerful scherzo and trio. The finale's octatonic motif and the work's restless, energetic rhythms reminiscent of Le sacre lend the work a certain affinity with Stravinsky. Shadow (the title derived from a story about the origins of Yaddo, where the work was written) is a haunted, yet hauntingly lovely, interplay of textures, impressions and moods in rich, layered counterpoint of contrasting material.